It is worth while reminding the reader that Iamblichus was not merely a mathematician and a philosopher, in the idealistic fashion: he was of a princely line, and well-educated, and his caste seems to have been that of Brahmin. Iamblichus wrote a life of Pythagoras, an autobiography of his great master and teacher. For those who claim the Unity, experience the double oath of Heaven to Earth in the Dyad, reaffirm that Unity in the Three, and move into the realm of Creative affects with the Tetrad, they find the Pentad ready to aid their Will. Venus traces a Pentagram in the sky with her motion through the celestial heavens. The Pentagram is the sign of the Satanists, but then, they only pay attention to one symbol, and ignore the rest, for the Pentagram is integrally related to the Monad and all that comes prior to it. Unlike the Dyad, whose movement is Divinely Feminine (another Monad) but also ambivalent (in that it duplicates the One : for what purpose? – one asks at first), the Pentad is half of the Decad, and is equivalent to the final Completion. The Pentad is 2+3, the first even number (Female) added to the first male number (Male: odd). As such, it is emblematic of Life itself, the pattern of symbiosis and resulting energies from the union of 2 and 3 (which are also, in Christian tradition, the Son and the Spirit, in the Father). 5 mediates the interplay of Life. 5 follows Creation (4), and manifests Justice, which always splits things into an equal and unequal portion (one side 2, one side 3) in order to determine which side requires re-balance. Life results when the rational side of our nature (the smaller, or 2) is given priority or balance as against the appetitive side of our nature (represented in 3). Life is the restoration of balance, or the Circle, in which no value exceeds its place or any other value. Instead of Equality in the modern sense, perhaps modern men should study the Justice and Balance of the Number 5, whose inequality is manifested precisely in order to redress Balance and indicate which is lower, which is higher. The five pointed star is also (and I add this) quite obviously a picture of man, who has 2 legs, 2 arms, and a head which decides the balance between them as what to do. The proportions of the pentad are based on the Divine Ratio, and generate the number PHI. (I should mention here that there is some additional symbolism related to man as having an extra appendage, and being symbolized in 666: Man has to seek his polar angel and find salvation in his “lady”, the one who represents the Divine Feminine to him, and mediates Life, since the particular feminine for him is more complete). The pentad’s symbolism can be directly related to the Divine Proportion. And the regeneration of the pentad is related to the value of phi (?). The image of the pentad is found in nature in leaves and flowers. 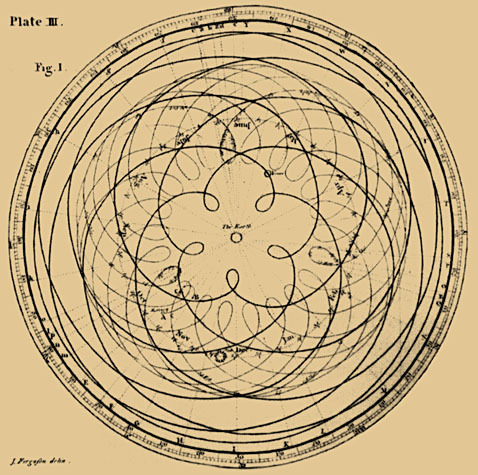 The Greeks believed each point of the pentad to represent an element: water, earth, air, fire, and idea. Early Christians used the pentad to represent the five wounds of Christ. The symbol, when the point is directed downwards, was later used as a sign for Satan and the Devil. We will see that the Pentad is in some sense a total completion, as the perfect number (Decad) is simply a repetition of Pentad, just as the Dyad is a repetition of the Monad. 1:2::5:10. Also, 1+2+3+4+5+6+7+8+9= 45, divided by 9 = 5. 5×5=25, x5 again = 125. The third square encompasses itself. It also encompasses two previous squares: 16+9=25. The Pentad is a mediator and balance : it is abundant Life, the Star upon the Cross. So many esotericisms degenerate into chaos because they ignore the Tetrakys, the sequence of all Ten Numbers, 1 through 10, and their inter-relationships. Some emphasize the Monad at the expense of the Upper Waters, Sophia, and the Divine Feminine or the birth of the Logos. Others situate themselves within the Dyad, and ignore how the Dyad can only exist because of primal Unity. The Satanists, as noted, delight in inverting the power of Life in the Pentagram. On the contrary, the true initiate is aware of All Things and All Number, simply because they are fully aware. They do not fixate on one manifestation, but penetrate to the Divine Principles which animate created matter. For example, the medievals noted that there are five ordinary senses and five wits. The ancients knew that there were five perfect 3-D shapes: 4 elements, and one called the aether, which was the “air within the air” (and all the other elements). Could one say that elemental Light is the aether? That the Middle Ages strove to embody the Light of Dionysius in their cathedrals, to begin the ascent from real matter up into the higher worlds?